Koh Chang Cooking Holidays offers you the chance to visit the beautiful island of Koh Chang. Explore the island, relax and take in the tranquil atmosphere while learning how to cook some of your favourite Thai dishes. You will have the chance to cook at 2 different schools where your Thai cooking instructor will demonstrate making several Thai dishes. A typical class will prepare 4 dishes and a Thai fruit cocktail drink during a morning or afternoon session. 5 days, 4 nights accommodation at good quality resorts, a morning and afternoon at a cooking school, return transfers from Bangkok or Pattaya, excellent food and an all day snorkeling tour. Whether Thai food is your favourite, cooking is a hobby or maybe your just curios. There is no better way to learn how to sizzle up your favourite Thai dishes, than by taking a Thai Cooking Course. Koh Chang Cooking School provide Thai Cooking Courses in an ideal home-style learning environment that is different from most other hotels and restaurants. Walking on Koh Chang in the jungle near to Bang Bao fishing village, in the south. This Hidden natural paradise is the spectacular tropical rain forest of Koh Chang. On your Koh Chang Jungle Trek there will be many opportunities for viewing monkeys, birds, tarantula spider's, reptiles insects and snakes. 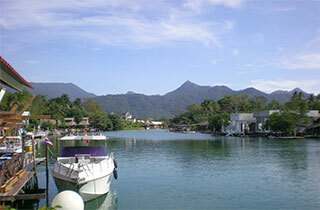 Starting in the south of Koh Chang you will walk north along an easy track towards the interior of the island. The trail that you follow is a one way loop that is mostly in the shade, covered by rain forest trees.